If you want to convert MHT files to DOC format in your application, you can implement it by one of two ways - program it from scratch or integrate ready-made converting functionality. The second variant implies much less efforts from programmer and guarantees successful result. 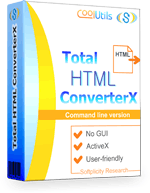 For this Total HTML ConverterX is highly recommended as MHT to DOC SDK that features all required settings and performs high-quality data export. This is only a short list of all supported conversion modes. Working as a standalone MHT DOC server converter the application processes conversion requests coming from server clients. It can work in multi-user mode, and only one license is required. All requests will be processed in turn. If you would like to integrate Total Doc ConverterX into some other application, you may use ActiveX technology. It can be also used to build in the converter into a graphic interface. For converting MHT to DOC no GUI is available by default, so you can create any custom UI for your own purposes. The conversion of MHT files to Doc is fully adjustable. It is possible to setup specific paper parameters, insert watermark, add header and footer, set margins, etc. All these options are specified by convert MHT to DOC command line parameters, if no GUI is used. Mention that this is a batch converter, so many files can be processed by just one command. Total Doc ConverterX is a suitable development kit for various programming languages. It would be easy to develop MHT to DOC C# converter, as you can find ready code examples of how to integrate Total Doc ConverterX into your C# code. Download the SDK here in a free trial version.